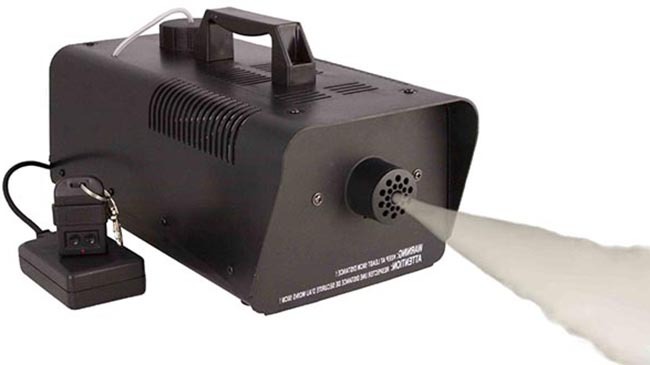 Fog Machine is a special effects tools that can create a steam, smoke or fog effect. The basic type of fog machine creates an effect that most resembles steam, however the plume of vapor will hang around and take some time to dissipate. The 'fogger' type smoke machines will create puffs of vapor that behave like smoke and can be 'wafted' with a large paddle or grip flag to turn plumes of apparent 'smoke' into a soft diffused looking vapor mist for creating a hazy mood to the lighting in the area. To create Steam/Smoke effects, use certain types of fogger juice. Steam/smoke emmits as a hot vapor and dissspates slowly. To create diffused or hazy look to an interior set, blow fog into the room and 'waft' with a 18x24 or 2x3 grip flag or similar wafting paddle. Small motions turn smoke into haze. To create low-lying ground fog, affix a screened cage to the front of the fogger machine and fill with dry ice chunks. Wrap the screen cage in duvatine or foil so that smoke is trapped and cooled by dry-ice. It will float down and lay low for a short time.